Many of the instructions in commercial patterns assume the sewer knows how to execute the techniques referenced in the patterns. Often this is not the case especially for new sewers. Some of our beginning sewers have expressed interest in simple garment construction. 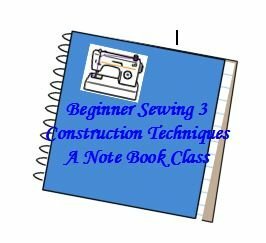 To provide a good jumping off point for simple basic garment construction I have put together this notebook class. We will BRIEFLY review some of the basic fabric information you learned in the Beginner One class. Beginner One is a prerequisite for this class. There will be directions for many techniques that will serve you for the rest of your sewing life. PLUS, you will have a sample that you have sewed in class with each new technique. Remember also that you may take as many pictures as you want to add to your notebook as an aid for yourself. Some of the techniques we will be learning are Bias Bindings, Bias Facings, Buttonholes, Buttons, Collars, Collar Tips, Easing, Facings, Gathering, Hems, Hand Stitches, Plackets, Seam Treatments, Sleeves, Waistbands, Zippers, and more. You will not only learn what these techniques are and how to execute them but when and how to use them. After completing this class, simple garment construction should be a snap. You will then be ready to learn new embellishment techniques which will add real fun, personality, and personalization to your garment sewing. I will provide notebook pages. You will need to bring a 3 ring binder for the pages. I personally like to have some page protectors or zip lock bags to slip my samples and extra notes in as I progress thru a notebook class. You will also need your basic sewing supplies, your sewing machine and manual. The class fee is $150.00. The registration fee for this class is $75.00 with the $75.00 balance due by the first class. Your seat will be reserved when your registration fee is received. The minimum class size is 4 and the maximum class size is 6. There will be additional costs for this class. There is a sewing sample kit you will need to purchase from me for this class. The cost of the kit is $25.00 including tax. It will contain most but NOT ALL of the supplies you will need. Dropbox links to the class videos are included in the cost of this class. The link will be sent to your e mail address after class. Previous classes really appreciate the step by step videos and have found them a very useful tool to support the skills they are learning in class. You will get class information via e-mail so PLEASE be sure I have your current e-mail address and phone number. some materials will be provided for you. You will get a list of those materials you will need and those provided via e-mail before class and also in your class booklet which you will get on the first night of class. Beginner 1 is a prerequisite for this class. You must have a working sewing machine and basic sewing supplies. You will have to purchase some project supplies.